The Wildlife Rescue & Rehabilitation Centre, Bangalore (WRRC)www.wrrcindia.orgis a Public Charitable Trust established in 1999, with the intent of rescuing and rehabilitating urban and captive wildlife - rescued from injuries, potential conflict situations, commercial and abusive captivity and so on. We are registered with the Animal Welfare Board of India, The Federation Of Indian Animal Protection Organizations, and NASSCOM as well. We have our FCRA Registration, and a 501 c (iii) in the USA (vide our sister organization CUPA – US) and the UK registration for tax exemption as well. 2005 – WRRC published book on the plight of captive elephants in India titled – "Gods in Chains". This was translated into Hindi in 2014 and found a wide readership with the common public. Inspired by the book, a movie named Gods in Shackles has been filmed, which will be released soon in India. 2006-15 – WRRC published, collaborated and co-authored 50 books and reports (reports available here - http://cupabangalore.org/captive-elephants-welfare/) on the welfare status and management of captive elephants in different management regimes in India. Many of these have been used by the Wildlife Departments of State Governments and by the Animal Welfare Board of India to expose the violations being committed on captive elephants by their owners, custodians and institutions., these books have been chosen by the US Library of Congress for the central library in Washington State. We request for your support for our flagship program titled as CaptiveElephant Welfare. This program focuses on transforming the Captive Elephant industry in India, both in terms of improving the capacity of present elephant owners to provide better care, housing and medical attention to their elephants, while also advocating for more robust legislation that regulates and enforces strict regulation on captive elephant trade, use, registration and management in India. Furthermore, for cases, where the elephant is severely abused and the owner not in favor of changing his management regime, we have used the legal channels available to us, and rescued 5 elephants at present from varying commercial captive situations and have created rehabilitation centers at Malur and Marakanam respectively. These rehabilitation centers are intended to be permanent sanctuaries, where these abused and overworked elephants are finally able to rest, and live a cruelty free life, where they are not forced to work or perform to earn a livelihood for their owners. These elephants have been commercially exploited all their lives and some have spent over 5 decades in captivity after being captured as infants from the wild. Providing a safe, international standard sanctuary for elephants is a considerable financial undertaking, which we are able to achieve only with the kind and generous support, of institutions and individuals who are committed to providing a safe, compassionate environment for these animals, and who understand that while the elephant maybe revered in our culture, the reality of their captive conditions is very different. We believe this is a pioneering opportunity in India, to contribute to the care of these gentle giants who have been unfairly and ruthlessly commercially exploited for most of their lives. Your support will help us build the much needed awareness about commercial elephant keeping in India, and improve the way we treat these animals that we worship in our culture, but neglect in reality. Animals are our nation's great vote less and voiceless majority, and it is our responsibility to ensure we undo the harm we have caused them and teach our children to respect and care for these gentle lives who are deserving of a more respectful and cruelty free existence. 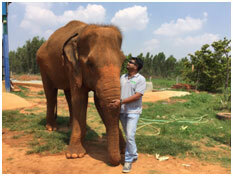 Elephants in permanent care: Aneesha&LakshmiIt is 2.5 acres of land leased to us by a philanthropist. This center currently houses Aneesha, a 48 year old crippled, former logging elephant and will also soon house Lakshmi, a former temple and begging elephant from Tamil Nadu. Though she was rescued in May, her feet were very severely affected by foot rot, and lack of medical care under her previous owner, so that she couldn't undertake the 12-hour journey to Bangalore. So she is housed currently in a temporary transit center in Rajapalayam, Tamil Nadu. We need support to enrich and improve the Facility, to ensure we provide these Elephants the best possible environment to help them recover and rest. Elephants in permanent care: Indu, Jayanthi, SandhyaIt is 18 acres of verdant green surroundings managed in collaboration with the Tree Foundation, who owns the land. This center currently houses Indu, Jayanthi and Sandhya , three elephants rescued after being voluntarily surrendered by the Kanchipuram Temple. After decades, of life on concrete floors, in chains with no opportunity to interact with one another, these three elephants have been united at our rescue center, and are forming close social bonds, while also enjoying a life without chains, with opportunity to engage in their natural behaviors such as foraging, mud wallowing, soaking, playing and interacting with one another. We require support to maintain the facility, provide food, water and round the clock veterinary care for the elephants and develop outreach and awareness building initiatives for local communities, to build an understanding about commercial captivity in India and enable communities to be more active and engaged in captive elephant welfare in India. Aneesha:Aneesha, age 48, rescued from an illegal logging outfit, where she was made to work even with an injury leading to a permanent handicap. She is now housed at our Malur Elephant Care Facility, where she is discovering the joys of being an elephant again! Lakshmi: Lakshmi, age 60, rescued from a private owner, after spending 6 decades in a small dark room, with terrible foot rot, that caused her unimaginable pain. Her owner said "I keep her in pain because I can control her better'. She is now with us receiving medical care and will soon be a permanent resident at the Malur Elephant Care Facility. Indu (39 yrs), Jayanthi (18 yrs), Sandhya (60 years)rescued from a temple where they were not allowed to socialize with each other, housed in concrete enclosures, and made to perform in temple activities. They are now at our Marakanam Elephant Care Facility learning to bond with each other and enjoying a life free of chains. Stephen Koyle who started www.elephantcareunchained.comhas spent more than 27 years caring for animals. He has spent the last 15 years specializing in elephant care. Throughout his career Steve has traveled around the world inspiring future elephant keepers, zoo teens, animal rights activists and zoo board members. His passion and work ethic have driven him to form Elephant Care Unchained. In May of 1999, Steve earned a degree in Zoology from Michigan State University. Early in 2000, Steve began working at the Wildlife Waystation in Los Angeles CA. There he cared for numerous exotic animals including Chimpanzees, Lions and Tigers. In March of 2002, Steve began working as an elephant keeper at the Phoenix Zoo. It was at the Phoenix Zoo that he began honing his skills as an elephant keeper. In Nov. 2004 while working at the Phoenix Zoo Steve attended European Elephant Management School in Hamburg, Germany. In Feb 2011, Steve attended AZAs Principals of Elephant Management. He was an instructor for elephant care workshops at the Phoenix Zoo in 2007, 2008, 2009, 2011, 2013 and 2015. Steve has become an expert and very well respected for his knowledge of target training using positive reinforcement, designing facilities that support elephant health and specializing in proper elephant foot care. Steve's original conception of Elephant Care Unchained was born in early 2013 when he made his first trip to India as a skilled volunteer with Wildlife SOS. Wildlife SOS is an organization that rescues all native Indian wildlife including elephants. It was there that he learned about the cruel treatment of elephants in their native countries. The brutality that elephants endure on a daily basis was something Steve felt compelled to address. It was after this eye opening experience Steve decided to commit his life to improving elephants lives globally. 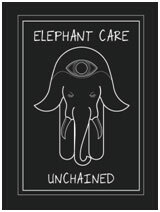 He has now established ELEPHANT CARE UNCHAINED, a 501c3 organization dedicated to eliminating cruelty and improving elephant welfare in their native countries. HIS was founded in 1980 by a British animal lover Miss Crystal Rodgers, aiming for helping suffering animals and all living things. The veterinary hospital was started with limited resources, in a small area, which was later extended to 2 acres of wooded land in south Jaipur, in the Indian state of Rajasthan. Help in Suffering provides free, quality, emergency medical and surgical care for domesticated and street animals, regardless of age, who are ill or victims of traumatic injuries and who have been abused, starved and/or abandoned by their owners. Help in suffering "HIS" is run by a team of extremely dedicated staff members. Their compassion for animals is what drives them to strive harder. We have 35 trained staff members for handling the sick and traumatized animals. Five rescue ambulances and two mobile clinic vehicles. Animal welfare projects are conducted under the guidance of trained Vets. The campus provides peaceful surroundings and a serene, green natural habitat for animals to support quick healing. HIS also has adequate administrative procedures in place to ensure documentation, accounting and overall management. It has been almost four decades and we are still providing shelter, medical aid and care to birds and animals of all species. This would not have been possible without the support and encouragement of our donors. Indeed, in the absence of any governmental funding or support, it is only due to the generosity of our donors from all across the globe, that HIS has been able to sustain its self. Over the years, we have grown into a large animal welfare organization with a number of projects. We can proudly claim that due to our vigorous efforts, Jaipur has become the only city in Rajasthan, which is Rabies free. Our Animal Birth Control program is another of our success stories, as result of which, dog bite cases in Jaipur are very few as compared to the other parts of the country. We also run a specialist Camel Rescue Centre in Bassi, in rural Jaipur district, to serve sick, old and injured camels. Our mobile camel rescue team is well known in the state for their tremendous work and dedication. Having achieved so much and in spite of having served for 4 decades, we are still constantly working towards improving the facilities that we are able to offer. Owing to the substantial cost of medical equipment we have been unable to upgrade our resources. We are desperately short of some life-saving and diagnostic tools, which are common place in all hospitals but are not available for animals. However, we forge ahead, undaunted to provide the best we can under the circumstances.